Every day I see a broken handler, broken by their dogs behaviour, they often describe their relationship with their dog as a “love / hate relationship“. There are parts of their dog that they love beyond what words can describe, but there are elements of their dogs behaviour that make them anxious, frustrated, frightened, feel weak – typically a broken handler. This is sad to see because their dog in almost all cases does not mean to make them feel this way, it is just another “symptom” of their dogs behaviour. 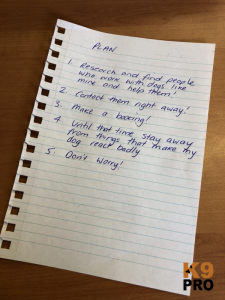 Empowering people to train, handle, reward and guide their dogs is one of my most favourite things to do, and that is because the recipe to creating an empowered handler is not the same each time. In fact it is quite typically something different for every person. Some need to see that their dog can be around other dogs, some need to see that their dog can follow instructions and some need to see other things, but ALL of them need to feel EMPOWERED, to feel hope, to be optimistic about their dog once again. Remember back when you were deciding to get a dog, the dreams you had, the great moments that you would both share, the fun times you pictured in your head? This then motivated you to get the dog and get started on your exciting journey. There are so many people that have never been able to get to the point in which those dreams came true; and here is my first tip of this blog. The difference between a dream and a plan is action. This sounds simple but you need to write down a simple 5 step plan right now. Something simple and not complex. Maybe like this. Then action it, this means set a date to get started and don’t break the date. At K9 Pro, my trainers and I focus on empowering the people we work with, showing them that not only can their dog do it, but they can too. Yes for some people, they are very broken, and empowering a person who has failed thousands of times is not an easy task, but it is the task nevertheless. The dog will not listen at all to the handler under any sort of distraction. The dog’s behaviour causes emotion in the handler, either embarrassment, fear, anxiety or frustration and due to point number 1, will not stop when asked to. The handler has tried many things to try and change the dogs behaviour with no success. Taken advice from friends, instructors, clubs and perhaps behaviourists all with no success. The dog is big and/or strong and the handler feels weak or hopeless when trying to stop him or her. The dog could hurt someone or something, or themselves, maybe even you. 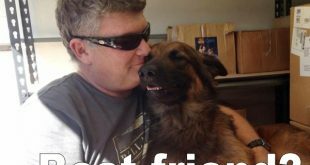 The handler has been advised by a “professional” that the dog cannot be fixed but you can’t bear the thought of euthanizing the dog due to the “love” part of the love / hate relationship they share. The handler has been told they can only use certain methods, tools or systems or they are going to hurt or damage their dog. Arguably the most cruel thing you can do to a person who is struggling is severely limit their options. Imagine your goal was to empower someone who has been exposed to the points above, you can imagine you have to do something pretty special to ignite their optimistic, HOPE again, right? Well welcome to a day at K9 Pro, perhaps not every day but certainly many days. Imagine people travelling from interstate to see you, they have taken time off work, packed up the car and driven, many thousands of kilometres to see you because you are their last hope. They have been told by family and friends that they are stupid and ridiculous to put this effort into a “dog“. But that is no relief for them. They have been told to euthanize the dog but that is not the answer, yes the dog and his or her problems will be gone but so will that element they love. I have seen people make this choice and regret the undoable choice they made for a very long time. Well we take very seriously the fact that we have been trusted and been given the chance to help a person who has had such a hard time and is maybe at the end of their tether; and you can bet we are going to give you our best. I remember a lady was coming to see me from Adelaide I think, she got in her car with her children and her two dogs and started the journey, planning to stop overnight somewhere in between. She woke up the next morning and went to leave the small town and her car would not drive. She found a mechanic who told her that her transmission had failed and would take 4 days to repair. She walked out of that mechanic and into the used car yard on the corner and bought the cheapest car they had, she said “I have to get to Steve!“; and get to me she did! and get help, SHE DID! There are some misconceptions I wanted to cover as I feel they need to be cleared up for the Broken Handler. Can my dog really be fixed? The first thing we need to establish is that your dog is not broken. Your dog has learned some behaviour/s that aren’t helpful. The behaviours you see are likely the symptoms of a deeper problem, most people treat the symptoms and this is why the problems don’t go away. Your dog will never forget how to display the behaviours you don’t like, but they can learn new behaviours and prioritise those over the old ones if the root cause is addressed. Dogs that display behaviour problems would call them solutions because they actually help the dog achieve something. So dogs are motivated to display these behaviours, even if you don’t like them. Many breeds are genetically inclined to be durable when engaged with something, so when your dog is displaying aggression etc it is quite normal that they may not take food or be easily persuaded to change their behaviour. Behavioural Medicine is not a cure, it is an aid to help therapy progress. If I use anything other than love and rewards my dog will not like me! Did you vaccinate and or microchip your dog? These do hurt to some degree and I am sure your dog did not hold you responsible, and if he or she did, the goal was to HELP your dog. People who tell you these things need to be avoided as they are either uneducated or so focussed on their own agenda they are willing to take away any hope you have to remain in power. Here is a thought to consider, you walk your dog down the street and your dog wants to go up to another dog, or a person or anything really and you don’t allow this. This means that your dog feels that approaching the dog or person is rewarding, so when you prevent the dog from accessing this reward, this is called Negative Punishment. Many people will say that Negative Punishment is not really punishing, but I feel that Negative Punishment aversion is directly related to the value the dog has for the reward. So the reality is, you areprobably already are doing something other than loving and rewarding your dog. 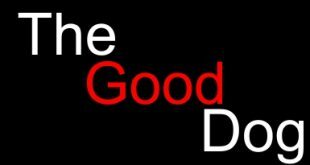 To help better understand what I am takling about, check out a previous Blog I wrote called “Positive doesn’t mean good“. I rarely heard of a dog that was anxious until about 10 years ago, now when I say rarely I would say I might have seen one dog a month that the owner would call anxious. These days over 75% of my clients tell me their dogs are anxious, the problem is that most people don’t know what the symptoms of anxiety are in a dog and what it means. This equates to the fact that out of that 75% of dogs that owners or others have diagnosed as anxious, maybe 5 – 10% actually are. I have dogs that come in and lunge and jump at me and whine to get my attention. Sweet dogs really that love people. If the owners holds the leash and doesn’t allow the dog to approach the dog starts to bark out of frustration through denied access. When I am told this is ANXIETY, I need to help people understand what “anxiety” actually is and or looks like, because this dog is simply frustrated that it cannot have everything it wants, right now! Anxiety for many people is a debilitating condition so once we feel our pets are anxious, we really can feel sorry for them, and there certainly are anxious pets, but not to the degree that people think. Understand that if you were anxious and rushing home from work, and the Police pulled you over for speeding and you said “oh please don’t fine me, I’m anxious” I suspect you will be fined anyway. Why? because you’re putting others at risk and whether or not your anxious or being penalised will make you more anxious, this behaviour is not acceptable and must be stopped for your safety and the safety of others. This is the same for your dog. You need to be the ALPHA! Many people are told that they need to be tough and mean to their dog and if their dog does not fear them, he will not respect them. We had a lady come to see us with a German Shepherd that was showing aggression to visitors who came into the home. She was advised by someone to grab the dog and throw him on his back and hold him still until he submits. Well, other than this being really bad advice, there were a couple of “extenuating” circumstances as well. She told the trainer that she didn’t think she could over power the dog and was told “then you should not have a dog like this“. I truly do believe in structure and I feel a good leader is a calm person that gives good advice and direction, practices self discipline and also should be able to regulate their emotions. I feel the leader should be consistent and clear in as many interactions with the members as possible and reward often for co operation. 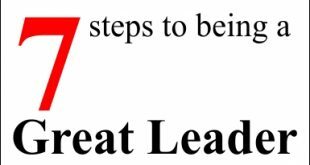 Good leaders help dogs make good choices rather than attack them for bad choices. If you’re feeling broken, I have a few tips for you that I think will help. Make a PLAN – I mentioned this above, but seriously do it. Maybe use these five steps. Take a break – avoid going places or giving your dog access to things that will provide the opportunity to display the behaviours that are breaking you. Maybe board your dog for a couple of weeks so you both can take a break and reset. Stop worrying about all the problems during this break – They will be there when you get back. Find something you both like doing, perhaps in your backyard or even your kitchen, use food or toys so that your dog will enjoy it. Here are a couple of simple programs to follow. GET HELP. Yes you have been to other trainers, and tried this and that and it didn’t work, but do not settle! Get help, track it down and get help for yourself and your dog. I wanted to finish this blog with an email I got from a client a while ago. She had a difficult dog that she adores, but loving him did not make him any less difficult. This is a strong woman who would not accept that it was not working and got herself help. Today I spent a bit of time thinking about the past 6 months and the time and money I have spent having my dog and myself engaged with you. What have I gained?? As I came back from my walk with my dog this morning, there was 1 word that kept repeating in my head. My Dog has gained skills he probably didn’t ever think he would need to. I gained a dog that obviously was trainable but today most importantly I began to feel empowered. Dread. Exhaustion. Fear. Despair. Aggravation. Regret. Sadness. Suddenly, today, these words I realised were past tense. Today, today was different. Today I realised I WAS empowered. Confidence. Ability. Control. Happiness. Calmness. Relaxed. Happy, they all replaced the above previous words. One word I realised had not changed. That was love. I love my dog. I don’t love him more now because I am able to feel able with him, I love him the same as before. I just love loving him more. Love existing with him more. So what have I gained? I’ve gained everything. I will continue to gain. My dog will continue to learn. I will continue to learn and through my learning my Dog also gets to gain more. Every morning gets better. I don’t look down the road 2 kms anymore fearing what may be there. Guys we ghosted a ridgeback today. If I had seen it before there would have been a lot of “F****ETY f*** f***!” Coming out of my mouth! Yeah my dog was keen to get closer but we managed just fine and we walked past other dogs again. #slow, all the way now baby! Some dogs are easier than others. Some dog owners are brighter than others. Some learning takes longer for some owners. I guess the most important thing is to learn. To continue to want to learn. To learn together and to give each other the chance to learn. So Thankyou for helping me out and continuing to help me out. 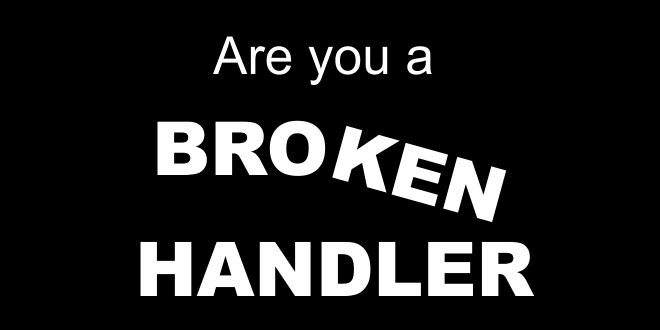 If you are a broken handler, come see us, we can fix YOU! Love to hear your comments! Feel free to share far and wide. Previous Off Leash dog? What to do! This is ME and Crosby who is my ‘owner/trained’ Assistance Dog. Cros came to me as a 2yo with ‘baggage’. We bonded and fell in love immediately so then I couldn’t return him to his breeder like others had before me. I pray that one day soon we can get to work together with Steve! I remember being The Broken Handler … I remember the fear, the anxiety, the frustration and the hopelessness I felt back then when I acquired an adolescent dog that I loved but couldn’t manage. Four months and four trainers later, my battery was close to flat when I finally connected with Steve. Thankfully, results were swift with the right help and training. Hard to believe that was 6 years ago! Bo Miller and I will be forever in your debt, Steve. Your help brought out the best in us both. Vicki many dogs and owners come to mind when writing this one including you and Bo. Shows even the tough and determined can wear down, but you came back charged and are living it today. I really enjoy your comments/blog/web site etc but do you do any work out of Brisbane? Hi Ian, sometimes we do workshops interstate but we have been so busy this last year it is very hyard to find the time. We have great options for interstate travellers though who come here. If you email info@k9pro.com.au they will help you.